Equal channel angular extrusion is used to consolidate a blend of Zr-based BMG (Vit106a) and crystalline metal (Cu, Ni or W) powders into dense composites. Chemical dissolution of the crystalline phase results in amorphous Vit106a foams with ~60% elongated pores, aligned at a 22-28o angle with respect to the direction of extrusion. The extent of Vit106a powder densification in the composites has been found to improve with the strength of the crystalline metallic powder, from low for Cu to high for W, with a concomitant improvement in foam compressive strength, ductility and energy absorption . As compared to traditional liquid processing, extrusion or rolling methods, ECAE processing of composites/foams has the advantage of lower contamination risks and scalability while also providing higher flexibility for controlling second phase/pore shape and orientation. We have also used equal channel angular extrusion was used to densify a blend of amorphous Hf-based BMG (Hf44.5Cu27Ni13.5Ti5Al10) and crystalline W powders without devitrification or formation of intermetallic phases . Post-extrusion dissolution of the continuous W phase resulted in ~60% aligned, elongated pores within an amorphous Hf-based matrix. The resulting metallic glass foam was the first Hf-based BMG foam reported and exhibits extensive ductility in compression, but at lower strengths than amorphous Zr-based foams previously created by the same method. A likely explanation is the incomplete bonding between the amorphous Hf-based powders during extrusion. 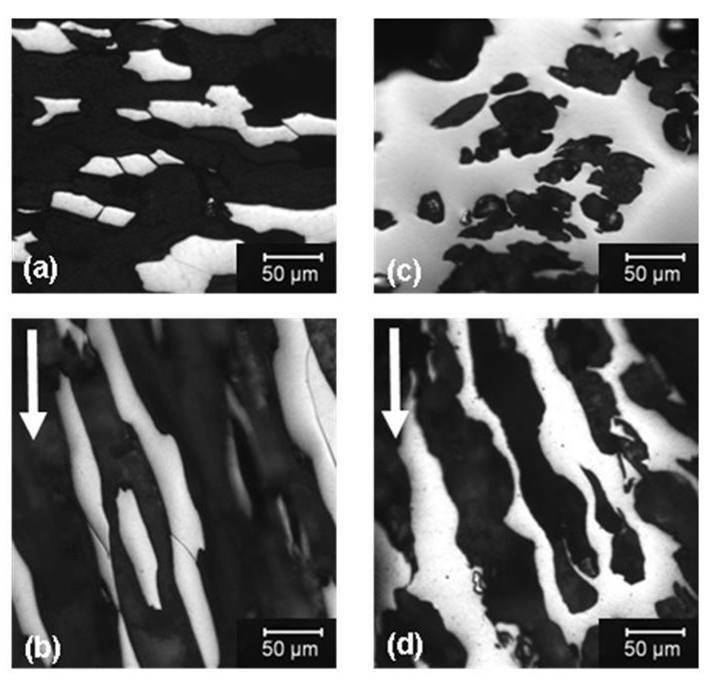 FIGURE 2: SEM images of fracture surfaces of Zr-based BMG foams created by dissolution of (a) Cu (b) Ni and (c) W space holders. The white arrows indicate the direction of extrusion. 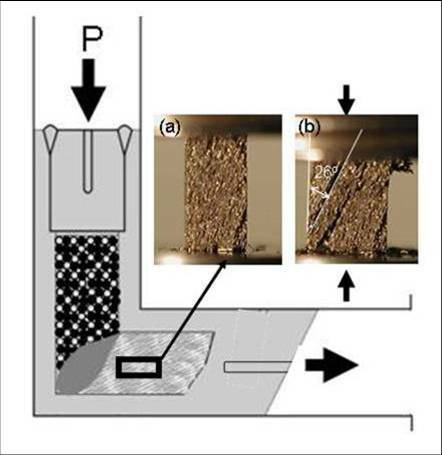 FIGURE 1: Schematic of powder billet during ECAE processing and the resulting Zr-based BMG foam made from a Vit106a/Ni composite (a) before loading and (b) after 24% compressive strain, showing cracks forming a 22-28o to the axis of loading. FIGURE 3: Optical micrographs of cross-sections of Zr-based BMG foam made with Ni space holders with plane of polish (a) perpendicular and (b) parallel to the extrusion direction and for the Vit106a foam made with W space holders with plane of polish (c) perpendicular and (d) parallel to the extrusion direction. The white arrows indicate the direction of extrusion. 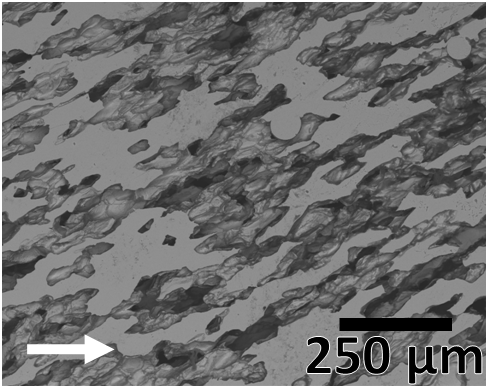 FIGURE 4: SEM micrographs of surface of Hf-based BMG foam before mechanical testing, with plane of polish parallel to the extrusion direction (arrow). M. E. Cox, S. N. Mathaudhu, K. T. Hartwig, and D. C. Dunand, "Amorphous Zr-Based Foams with Aligned, Elongated Pores", Metallurgical and Materials Transactions A, vol. 41, pp. 1706-1713, 2009.